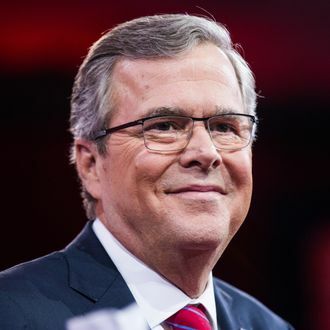 Like a Tumblr teenager who believes her true form is a wolf, Jeb Bush believes that despite his whiter-than-white heritage, he is, deep down, Hispanic — at least if his 2009 voter-registration application is to be believed. The application, obtained by the Times, shows that Bush marked “Hispanic” as his race/ethnicity. While he does have credentials that will appeal to Hispanic voters — his wife, Columba, was born in Mexico, and he speaks fluent Spanish — Bush is still a member of a dynasty that is so white, it literally helped the British settle Plymouth Colony. When contacted by the Times, Bush’s spokesperson had no idea why he’d listed himself as Hispanic, which is probably the first honest response ever elicited from a spokesperson.